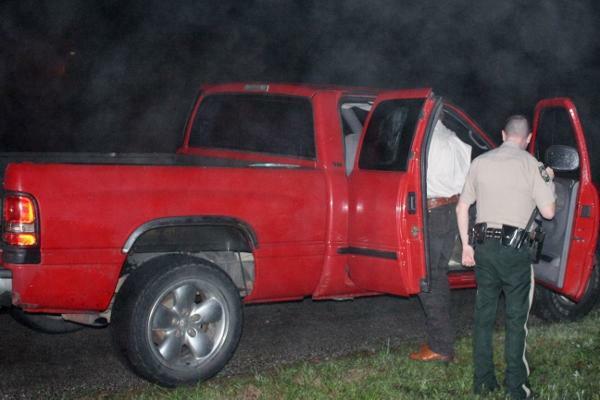 31 year old Amy Lynn Anderson of Colsmesneil was driving this 2001 Dodge pickup with no headlights, no tail lights, over 80 mph, and the rear tires were slick (with the wet road conditions, this was an accident waiting to happen). Speeding, No Headlights or Tail Lights, Drug Paraphernalia, LIVINGSTON, February 16, 2012 - At approximately 7:55 pm on February 15, 2012, Detective Richard Delaney with the Polk County Sheriff's Office was east-bound on US-190 West when he spotted a red 2001 Dodge pickup driven by Amy Lynn Anderson, 31, of Colsmesneil. What caught the attention of Detective Delaney was that the truck was traveling in excess of 80 miles per hour with no headlights or tail lights on (and it was dark outside). Delaney followed the truck for a few miles and pulled the truck over just a short distance east of the Corner Shell gas station on 190. Delaney was quickly joined by Deputy Monty Lee (also with the Sheriff's Office). In addition to speeding, Amy Anderson had no liability insurance and expired registration. Delaney had Anderson and her passenger, 54 year old Bobby Dean Digby, step out of the vehicle. Delaney spotted a syringe on the floor of the vehicle with a substance inside the syringe. Both were placed under arrest for possession of drug paraphernalia. Additionally, Anderson was cited for no insurance and expired registration. Anderson could be facing more charges as the substance in the syringe is suspected of possibly being methamphetamine and will be tested. Anderson's vehicle was recovered by LakeView Wrecker Service and will be stored in Livingston. Deputy Monty Lee puts cuffs on Anderson who seemed taken aback by the idea of being placed under arrest (Detective Richard Delaney is pictured at right). Deputy Lee escorts a crying Amy Anderson to a patrol unit to be transported to Polk County Jail. Delaney loads Bobby Dean Digby into a unit. Digby was arrested for possesion of drug paraphernalia. This syringe on the floor of the pickup is suspected of containing illegal substance. Anderson admitted to having an addiction of morphine products.